The Spanish sparrow, known also as Willow sparrow (Passer hispaniolensis Temminck, 1820) belongs to the order of the Passeriformes and to the family of the Passeridae and is one of the three species belonging to the genus Passer present in Italy. The issue about the number of the species present in Italy is today still debated as the present tendency is that of counting four of them, even if many still persist in classifying three. Actually, of these three species, the House sparrow (Passer domesticus) is totally replaced in our peninsula by an authochtonous subspecies, the Italian sparrow (Passer domesticus italiae) that occupies with millimetric precision our national territory, relegating the holotype only on the outer border of the alpine chain. As mentioned before, many consider this subspecies as belonging to the upper level, seen the compactness and the exclusivity in the occupation of the area, but in the mean time we witness hybridizations between our Italian sparrow and the house sparrow, in the northern borders of the territory but also with the Spanish sparrow, here treated, in the southern range and in order to render even more difficult the situation, between the house sparrow and the Spanish one along the coasts of North Africa facing our peninsula. Keeping in mind the presence on our territory of such variability and commingling, we can affirm that Italy is by sure a crucial crossroad for these species. Just to mention it, the last one of these, the Tree sparrow (Passer montanus) is instead the purest and far from these hybridizations and blends. 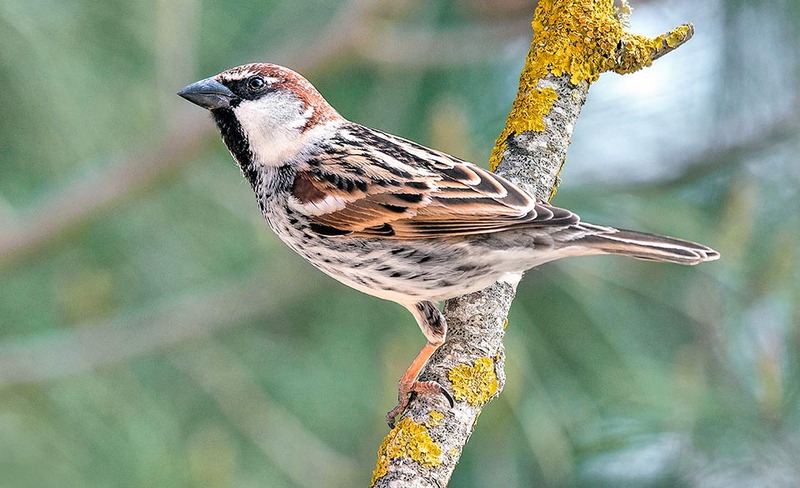 The etymology of the scientific name is quite simple: the genus Passer comes from the eponymous Latin term for the sparrow and the species hispaniolensis, always from Latin, to indicate Spain, place from which Temminck had brought the first specimen, locations where, incidentally, this sparrow is not extensively present. 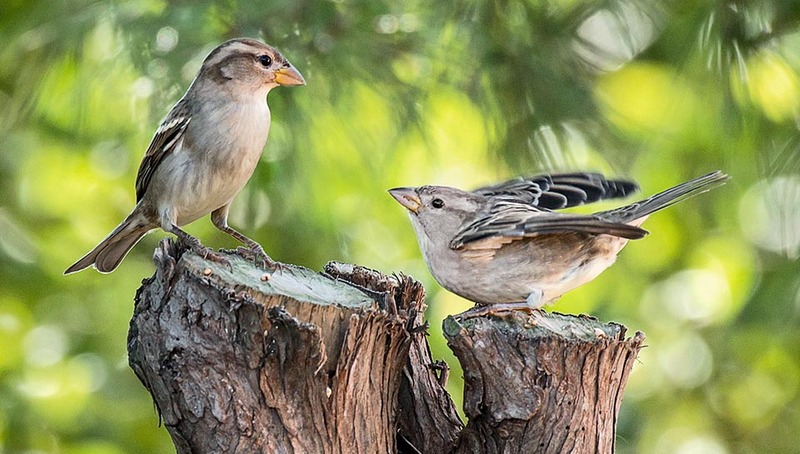 Here are some common European names: in Italian, Passera Sarda; in English, Spanish sparrow; in German, Weidensperling; in Spanish, Gorrión Moruno; in French, Moineau espagnol; in Portuguese, Pardal-espanhol; in Danish, Spansk Spurv and in Dutch Spaanse Mus. To note that among them all, it is just the Spaniards that do not call it commonly Spanish sparrow. It is not easy to describe exactly the territory occupied by the Spanish sparrow as there is not a well distinct range, a continuous and vast territory, an area in which we find it constantly present and well diffused. 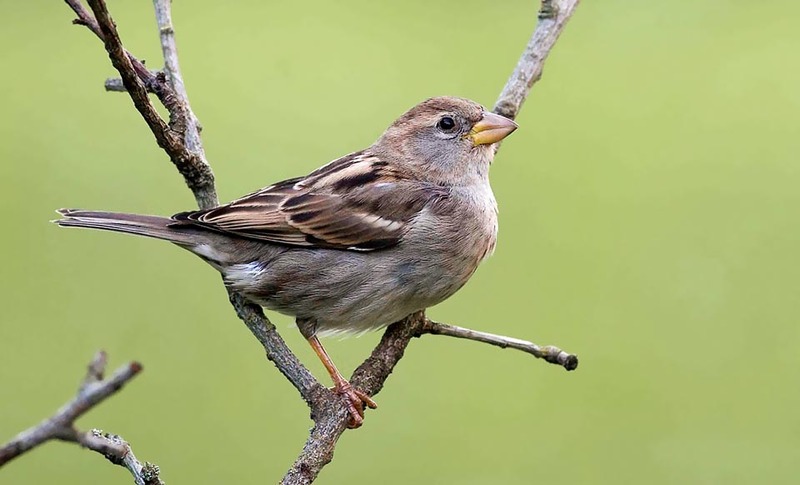 An example is the Mediterranean Basin, where it is poorly present in South Italy where it shares the area and hybridizes with the Italian sparrow, in Sardinia where is numerous and almost pure, but absent in almost all Corsica. Always in Italy, it has colonies that go far away significantly from its traditional ranges of the south, getting to colonize small areas of Romagna and of Gargano. It is then present in the south-western zones of the Iberian peninsula avoiding Portugal and strangely enough all the part north of Madrid, and then we find it again in the winter period, in the extreme southern part of Spain close to the African coasts. Again in the Macaronesia islands in its purest form, as well as on the African coast from Morocco to Libya where it hybridizes with the Passer domesticus, and then we find it again in the southern part of the Balkan peninsula and through Anatolia and part of Middle East, up to Uzbekistan in Asia. A patchwork of territories often shared and mixed with other similar species with whom, besides living together, it hybridizes creating in its turn subspecies that exalt or lose the characters of the parents after some generations. A real family turmoil! In the overlapping locations it is still now difficult to distinguish species from species and even less between the hybrids generated by these unions. Also the winter sites are fairly various and distant. 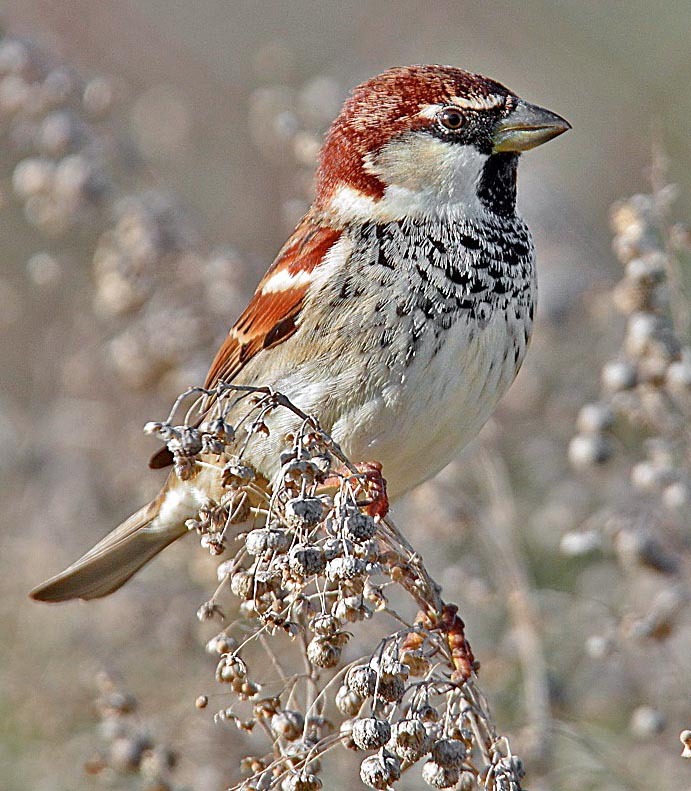 Usually, the Spanish sparrow is sedentary in the southernmost territories but is conversely regular migrant in many other ranges, with massive movements of entire populations leaving the nesting territories to move southwards in areas more suitable for spending the bad season. Typical are the populations of the Balkan peninsula and of central Asia that take shelter respectively up to the Mediterranean coasts the first ones and in the upper Persian Gulf and in the Indus Valley the second ones. The ideal habitat of the Spanish sparrow is a place with warm summers, subject to few precipitations, with mild winters, without sudden decreases of temperatures nor even subject to long lasting snow cover but in the same time they love also sites markedly more humid than those frequented by other house sparrows, with whom usually it lives. Both of them frequent farms and cultivated sites, as well as inhabited areas and at times even directly inhabited rural and city centers. In many areas it has increased the populations rightly following the evolution of agriculture that has attracted it with increasing widespread gramineous crops and various and enticing seeds. It loves also desolate and steppe areas, with low shrubby vegetation, with sparse thickets of small trees but surrounded by vast herbaceous cultivations also subjected periodically to the slash-and-burn. 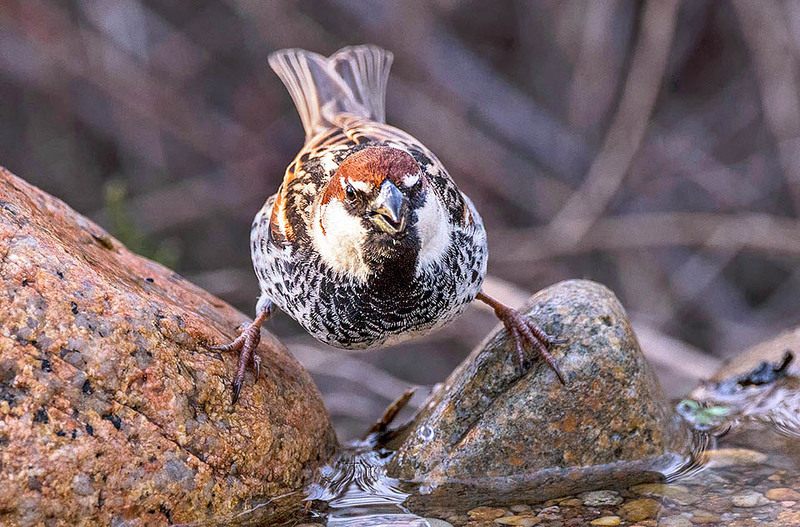 Leaving behind the description of the numerous morphological variations coming from crossings and interspecific hybridizations that it would be practically impossible to follow, the Spanish sparrow has the typical characteristics of the Passer domesticus) and copies strongly its livery. As a matter of fact the plumage of the male is quite similar, with a very marked hazelnut brown alar cover and crossed by very evident black bands; the head of compact hazelnut colour much more similar to the Italian sparrow than to the house one, with white face and cheeks crossed by a black ocular band that from the bill reaches the ocular area. Black bill and pinkish yellow legs with long and well sharp nails. 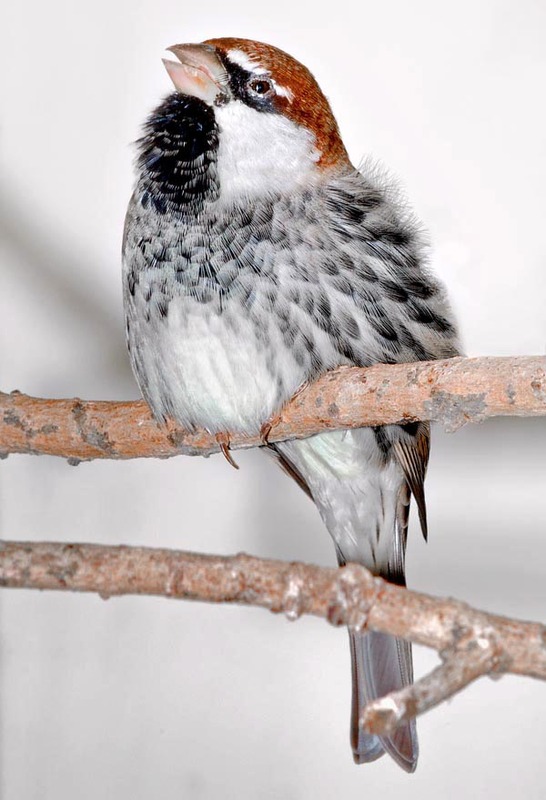 The colour of the chest is the determinant part for the classification of this sparrow. A vast and diffused black striping tha starting from the lower mandible, where creates a very reduced gag, can get to cover totally the chest up to the belly and on the sides, so much to render it appearing often totally black. Only the undertail has no streaks and is of cream colour. The female is almost indistinguishable from the congeners when observed in nature. It displays the typical cream coloured alar cover with slight streaks of darker shade and variegated with the whitish barbs of the feathers of the coverts and of some remiges, the whitish chest more or less spotted of brown and, as sole clue, a whitish eyebrow usually more marked than in the other species. The young have a livery much similar to the females but with a marked and well visible yellow buccal margin. The great variety of hybridizations has resulted in the classification of some subspecies among which not all yet accepted. The Passer hispaniolensis hispaniolensis diffused in the western part of the range, from Macaronesia to South Europe and Africa and the Passer hispaniolensis transcaspicus from the Middle East to all the Asian range. The Passer hispaniolensis maltae even if by many accepted as subspecies and that occupies the central part of the Mediterranean, from Sicily to the facing African coasts, is by some considered as an hybridization of the l Passer hispaniolensis with the Passer domesticus italiae. 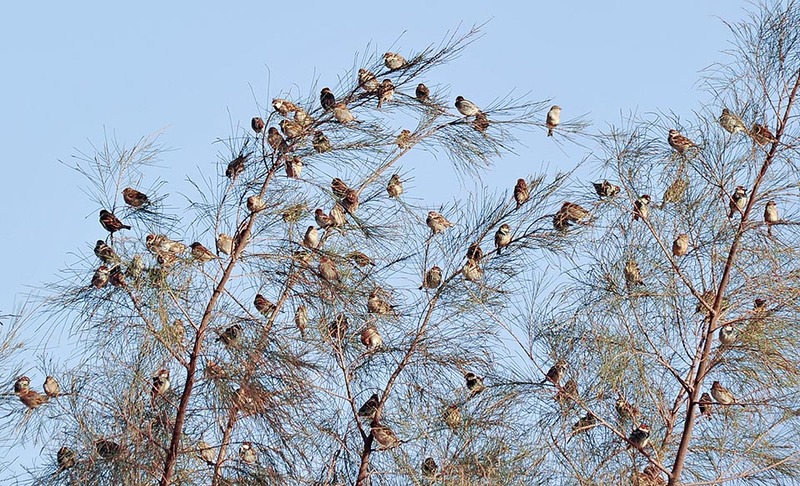 The Spanish sparrows are social birds and nest in more or less numerous colonies, signaling with their continuous chirpings the presence of their settlement. Once the area has been taken over, all the members are involved for the whole reproductive season, in the control and protection of the site that is guarded continuously and kept gay by one or more sparrows always chirping with their often boring and tireless “cislip cislip cislip”. 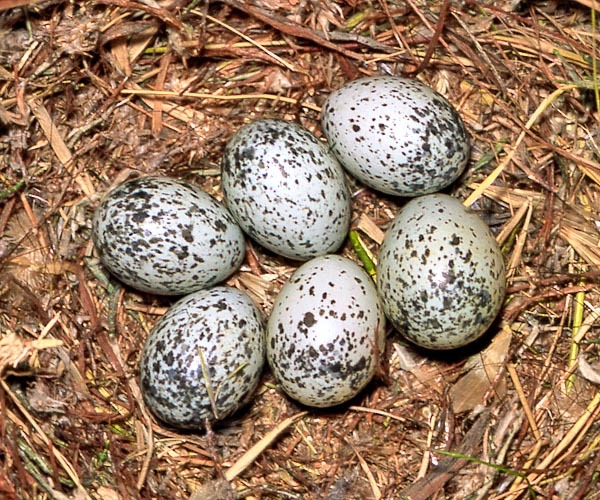 Nonetheless, it is a species who does not accept other congeners in the nesting area, even less in the colony hence the same is usually formed by monospecific members. The nest is placed under the tiles of a roof, in the slit of a wall, in old nests of swallows, in holes of old walls but also, in particular in good part of the range, intertwined among the branches of a tree, between the leafy tops of the palms, around a pole among the electricity wires, in dovecotes and in barns. The nest is a globular and messy mass of dried grasses with a lateral entry that leads to a niche covered by feathers and hairs but even a simple cup without opening when placed into narrow slits that do not allow the accumulation of too much material. 3 to 7 cream coloured eggs spotted unevenly of grey are laid, they are brooded for about twelve days and the chicks, who come to life blind and naked, take off for their first flight after about 2 weeks. At least two broods are done per season. 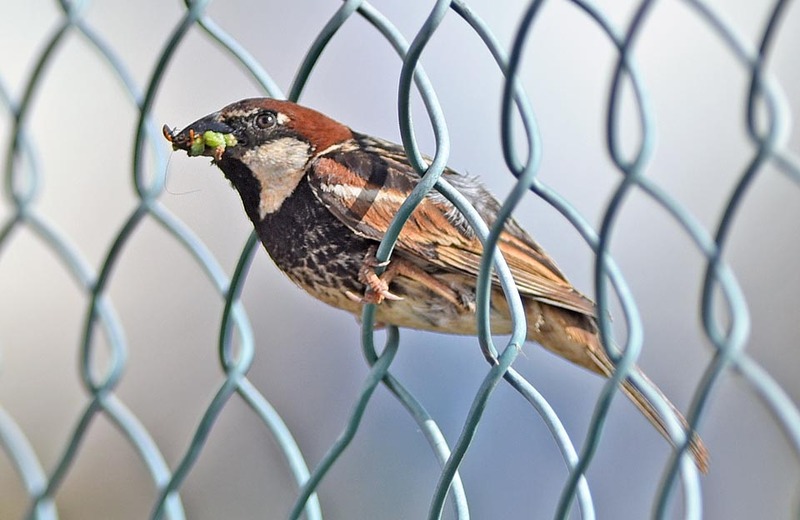 The feeding of the Spanish sparrow is mainly based on the consumption of seeds and of grains, fruits and wild berries, fresh buds and grass but also of insects, larvae, chrysalises especially in the nesting time, seen that it becomes the main food for the growth of the chicks. 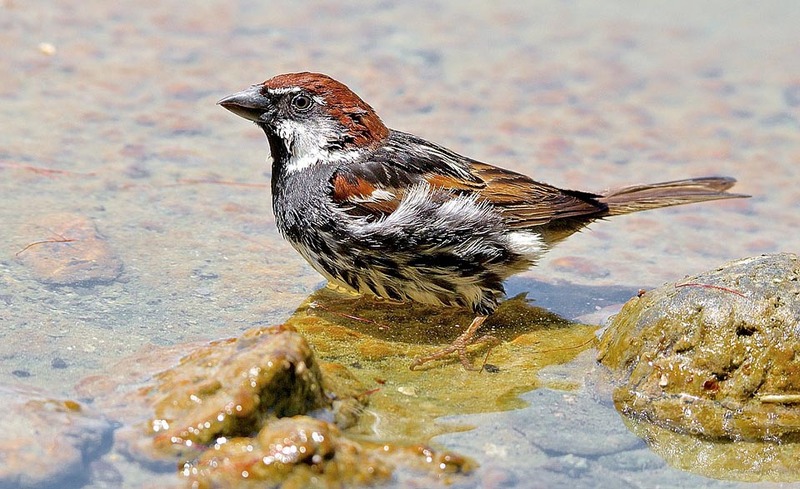 In Europe the populations of this sparrow have shown signs of weakness, with discreet reductions of presence in some locations, contrary to what happens in Asia where the species has considerably reinforced. Thanks to this situation, the species is not considered as in danger.